Looking for a unique holiday gift for someone special? How about an African safari? Right now we are happy to offer special pricing at the renowned Wilderness Safaris camps. Stay for 5 nights at camp and get the 6th night free! This would be a great standalone trip, or if you’re looking to get away for more time, Victoria Falls or Cape Town are an easy addition. Let’s not forget the true spirit of the season – giving and sharing. 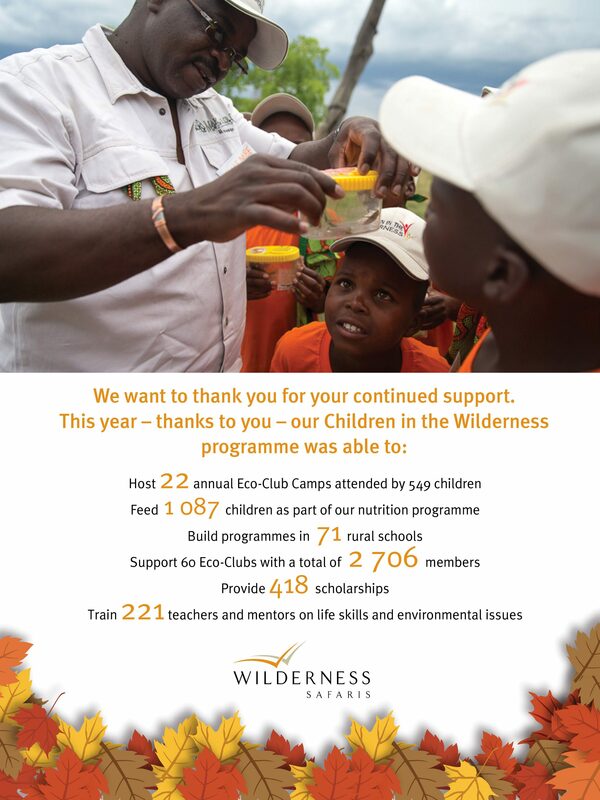 Your trip with us will support Wilderness Safaris’ Children in the Wilderness program, which supports education of the local children. This special rate is only available for travel through March 31st, 2018, so contact Jacky or Tess today to start planning! Keep reading for Esplanade’s favorite camps that are included in this amazing offer. At Abu Camp, you are invited to immerse yourself in the majestic world of the African elephant and to see the African bush and its wildlife through the eyes of the elephants – by joining the Abu herd. Located on Hunda Island, Tubu Tree Camp is built in traditional style. Hunda Island is known for its concentrations of game and offers both spectacular wildlife viewing on land, and tranquil adventures on the water. Xigera Camp (pronounced Keejera) lies on the aptly named Paradise Island, surrounded by deep channels and lush vegetation within a remote area of the productive Moremi Game Reserve. A retreat of contemporary and unique design, Vumbura Plains comprises two separate satellite camps. Game viewing at Vumbura is enjoyed on both land and water year-round – this habitat mix means just about every species found in the Okavango can be seen! Mombo Trails is only open through the end of February 2018, so book your trip to stay here now! DumaTau, meaning ‘roar of the lion,’ is located in the private Linyanti Wildlife Reserve, bordering Chobe National Park. It is situated close to the source of the Savute Channel on Osprey Lagoon, between two elephant ‘corridors’ – all of which results in a plethora of wildlife. Kings Pool overlooks the handsome oxbow-shaped Kings Pool Lagoon in the Linyanti Wildlife Reserve bordering Chobe National Park. Wild dog and leopard are known to patrol the area, and a sunken hide provides a unique elephant-at-eye-level perspective for guests. Savuti Camp is situated in the private Linyanti Concession along the Savute Channel, famous as a sporadic and unusual watercourse. As part of a natural cycle, the channel is dry once more, resulting in a rich feeding ground and corridor between the surrounding mopane woodlands for both plains game and predators. Linkwasha Camp lies in a private concession in the enormously productive south-eastern corner of Hwange National Park. Situated on the doorstep of the famed Ngamo Plains, the camp’s excellent location stands sentry over a magnificent plain and a pan that is a magnet for game year round. Little Makalolo lies in the heart of one of the best game viewing areas in Hwange National Park. Overlooking a vibrant waterhole, it offers privacy for guests who enjoy small camps and a sense of remoteness. Overlooking the mighty Zambezi River and some of its islands, Toka Leya Camp is splendidly situated in the Mosi-oa-Tunya National Park .The area offers many activities including safaris, fishing on the Zambezi, and adrenaline-pumping adventures, and hippo, crocodile and elephant are regularly seen near camp. Contact Jacky or Tess now to plan your African safari! Thank you to Wilderness Safaris for the gorgeous photos.